It's hard to believe that February is nearly over...it seems like I was just planning my trip to Indianapolis to attend Taste of the NFL thanks to the kind folks at Red Gold Tomatoes. Before I turn the page on my calendar to March, I wanted to make sure to share some fun details and pictures of my experience at Taste of the NFL. After a wonderful welcome dinner at Bonge's Tavern on Friday and tour of the Red Gold facilities on Saturday morning, our last official activity was to attend the Taste of the NFL fundraiser with about 3,000 other lucky people! After getting glammed up, we jumped into our waiting limo for the hour-long drive to Gleaner's Food Bank, the site of the event. 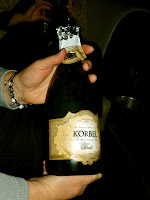 Our first order of business was to pop the cork on some celebratory champagne to get the celebration started! We laughed, took pictures, drank champagne, and enjoyed the truffles that we had been given by the nice people at Concannon's Pastries. Sigh...I'm telling you...I could get used to being driven around while I enjoy bubbly and chocolates!! Before we knew it, we were being dropped at the entrance to the event...we felt a bit like celebrities as we emerged from our limo. We met up with our hosts from Red Gold and entered the on the "green carpet" with 3,000 other people who were attending the event. Our first stop was at a table to register and pick up our programs and logo plate/wine glass combo. We paired off with one of our Red Gold hosts and set out to sample some amazing food and wine! Once I had my program, plate, and wine glass? I was ready to taste some amazing food and wine pairings!! We spent the next two hours visiting as many of the booths as we could. 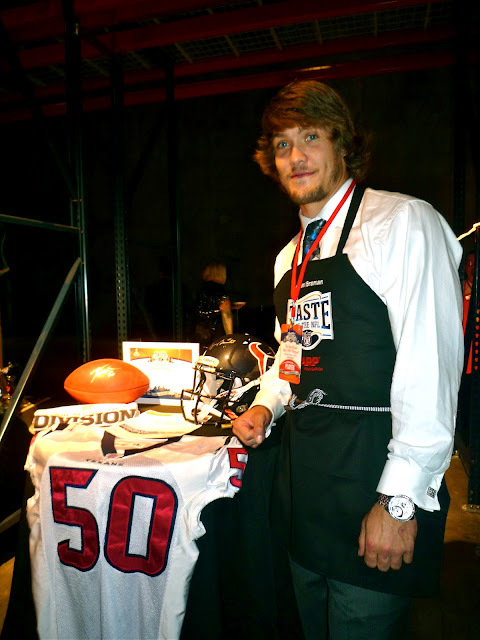 Each NFL city had a booth with gourmet food cooked by one of the city's best chefs, wine pairings to sample, and a current or former NFL player from that city's team. Of course, I was excited to visit the Houston booth...being a huge Houston Texans fan!! We sampled so many fabulous dishes, including a wonderful pork belly with over white beans...and a fantastic shrimp and gnocchi dish. Unfortunately, I didn't take that many pictures of the food. Between juggling a small clutch purse and my plate/wine glass combo...I only took my camera out a few times. The one dish that I did take a picture of was a fabulous chicken osso buco with purple potato puree. It was gorgeous and tasted AMAZING! Bryan Braman of the Houston Texans...what a nice guy! I chatted with him for a few minutes, and he was so genuinely friendly and appreciative of the Texans' fans! Amazing Chicken Osso Bucco with Purple Potato Puree...one of the many gourmet dishes that I sampled at Taste of the NFL. Almost too pretty to eat...almost being the key word! We met a few celebrities along the way...some of the girls met up with Ted Allen from Food Network's Chopped and got a picture with him. I was just on the other side of the table and talked with him, but was unable to get in the picture. But? I did manage to get in the picture with Mauro and Joey from Cake Boss. By the way? I sampled some of the cake that they brought...and I can vouch that their cakes are DELICIOUS!! By the end of the night, were were stuffed! We had an amazing time...we thanked our generous hosts and they told us goodbye since we were heading to the airport the next morning. I can't say it enough: our Red Gold hosts were the friendliest, most wonderful people!! They made us feel so welcome...truly like we were part of their extended family. We watched a few songs of Sara Evans's set, then we jumped back into our waiting limo for the ride back to the hotel. But not before snapping a few last pictures to remember our amazing evening! Two very lovely ladies: Monica from Red Gold's Marketing Department and Linda, Red Gold's Home Economist. Seven super-hot food bloggers out on the town! From left: Heather of Basilmomma, Deb from Just Short of Crazy , Lisa from Jersey Girl Cooks, ME (in my sparkly red top), Cathy from The Dutch Baker's Daughter, Renee from The Great Foodini, and Sherry from Superexhausted. All in all, it was a wonderful night was truly a Party for a Purpose: 7,000,000 meals were produced for families in need. We had a great time...and the money raised would truly make a difference in people's lives! For this Texan, the icing on the cake was seeing snow flurries on the way back to hotel. I'm sure the rest of the ladies...who are from colder climates...thought it was hilarious that I was so intrigued by snowflakes! It's not a common sight for me, so it really was the perfect ending to an elegant evening. And speaking of elegant? I want to share a recipe that has nothing to do with Taste of the NFL...other than the fact that it's quite elegant. One of my fellow Secret Recipe Club Group C members is Louise from Lick the Spoon. She has so many really great recipes, and I decided to make a slight variation of her White Chocolate Lemon Truffles for our Oscar-viewing treats tonight. They're so amazing that I had to share them with you! They're super simple to make...I had some fun key lime sugar crystals that I've been dying to use, so I tweaked her recipe to include a bit of lemon and lime juice and zest. Step 1: Add a package of white chocolate chips to a mixing bowl. Place 1/3 cup whipping cream and the zest of one small lemon and one small lime in a small non-stick pot. Heat the cream mixture over medium heat until it's hot...but not to boiling. Stir it every few seconds to avoid scorching. Step 2: Pour the hot cream mixture over the white chocolate and whisk until combined. Add 1/4 cup of a combo of lemon juice and lime juice. For me, that was one small lemon and one small lime. Whisk well to combine. Cover the bowl and refrigerate until the truffle mixture is solid enough to roll into balls. This took about 2 hours in my fridge. Step 3: Roll the chilled truffle mixture into bite-sized balls. Roll them in cocoa, powdered sugar, or sugar crystals. I rolled half of my truffles in powdered sugar and half of them in key lime flavored sugar crystals. I like the way the two presentations looked on my green serving platter. Both versions taste great, but the lime-green sugar crystals are REALLY pretty and provide a nice bit of crunch on the outside! Wowza...are these simple three-ingredient truffles fantastic! They have just enough citrus flavor to cut the richness of the white chocolate and cream...without making you pucker when you eat them. These are soft like ganache, so do store them in the fridge until serving time. I think next time I make these, I will dip half of them in melted white chocolate and roll half in the sugar crystals. Next time you have company coming, whip up a batch of these truffles. They're so simple to make, but they are so elegant that everyone will think you spent all day making them. Disclosure: Red Gold Tomatoes provided me with an expenses-paid trip to Indianapolis over Super Bowl Weekend as part of a contest. However, all opinions express in this post are my own.